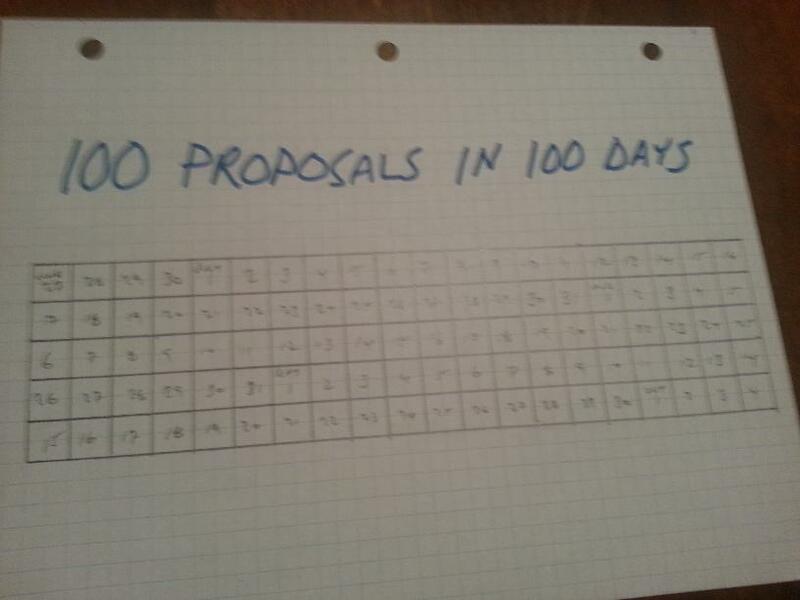 Last week I started a new personal challenge — to write 100 proposals in 100 days. I wanted to give you an update now that I’ve just passed the one-week mark of the challenge. 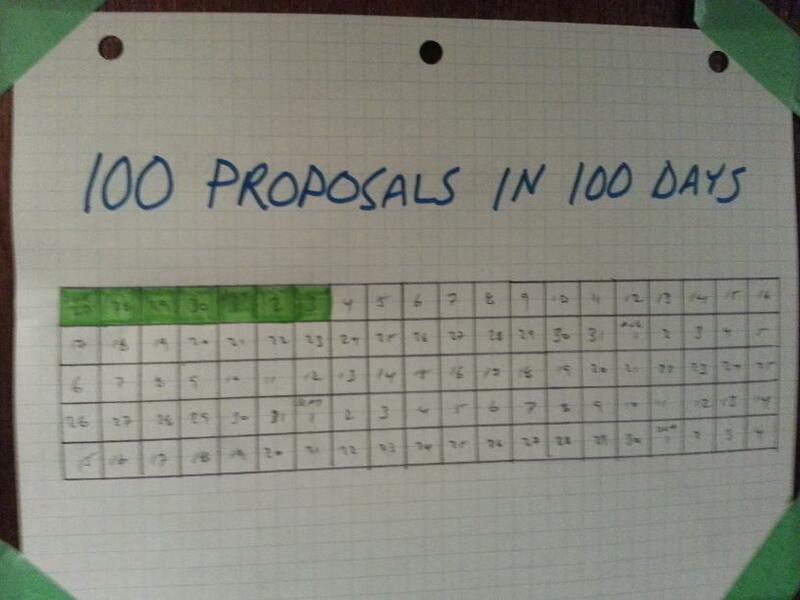 Here’s the blurry chart I made to track my progress. It started well on Thursday, June 27th. 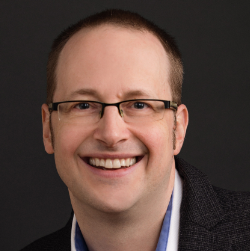 I threw myself a softball to start: My first proposal was actually to a client. (If you remember the rules to my challenge, I am allowed to pitch to existing clients but it has to be for new work). The proposal was for a project that I thought would be a great fit for her business based on some of her business goals that we talked about in the past. To my great joy, she responded the same day with a positive response so we’re starting that project next week! One of the reasons that I went so easy on myself on Day 1 was because I had guests visiting from out of town. They were here from Friday through Monday. It was so good to see them (haven’t seen them for at least 12 years)! Because I knew I was going to be busy with them, I spent Thursday and part of Friday planning the other proposals that I’d send out over the weekend so that I could do it quickly each day. I told my friends about my challenge and they generously let me slip away each day for a few minutes to write and send the pre-planned proposal for the day. So day 2, 3, 4, and 5 passed without incident. After they left on Monday, I kept going. Day 6 was Tuesday. I just finished day 7 yesterday. Since day 1, I’ve sent proposals to three prospects who I’ve never worked with before, a joint venture partner, a referral who might be a good fit for some really interesting work, and a magazine. Along with the positive response from my very first proposal, I’ve received another “let’s get started!” approval and I’m in the hammering-out-the-details phase with a third. That second “let’s get started” has already started! I’m well into the work for that new client already! Today is day 8 and I’m well on my way to completing a proposal for today. Here’s the bad news: This is hard. I absolutely love writing these proposals. But they have been taking up more time than I thought they would. Writing and sending them is easy, actually. The harder part is thinking about who to pitch to. What worries me is that so far I’ve been sending these to (mostly) people with whom I already have their contact info and have been thinking about a project already. But a couple have been brand new (in the sense of: I didn’t know who I was going to pitch to when I sat down to write the proposal) and those took a considerable amount of effort… and the number of “brand new” contacts is going to grow very shortly once I run out of contacts whose projects I’ve been thinking of proposing already. I’m not going to let it get me down. This blog post serves two purposes — to update you about my progress on this personal challenge, and also as a bit of a “checkpoint” for me to think about how I can improve the process. I’m enjoying it but I don’t want it to happen at the expense of anything else (like client work). I need to do more planning and even to start thinking about proposals a few days prior to when I want to send them. But with 2 approvals of 7 proposals so far, I’ve got some really cool work starting up in the near future.